The Perigeaux Wine Club offers members the opportunity to receive special offers on our wine and tastings and invitations to private events. Join today! You’ve heard by now that our wine at Perigeaux is award-winning. Check out our awards page to see proof. Then head to our shop to place your online order to enjoy it for yourself! These wines are our signature and reserve wines and are produced from “vinifera” grapes grown, nurtured and hand-picked from our estate vineyards located in St. Leonard, Calvert County, Maryland. Our estate wines are always fermented, aged and bottled in our winery. Mackall Road selections are destined to bear an organic certification. The grapes are selected from among those grown in our own estate vineyard and carefully monitored to ensure a consistent, quality table wine low in sulfites and made as natural as possible. 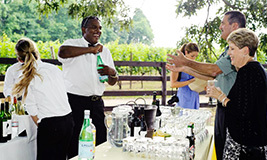 Patuxent River wines include any that are produced from imported grapes or juices and any specialty sweeter wines from among our own varietals. 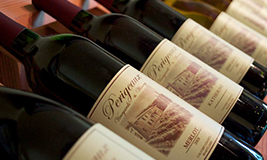 The Perigeaux Vineyards & Winery Tasting Room and Online Store are the best options to purchase Perigeaux wines. 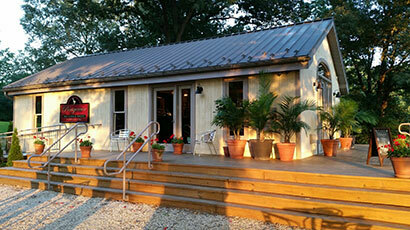 The Tasting Room carries all of our available products. Our wines are also available at select retail locations. The following is a list of stores that currently carry some of our wines. However, no retail location has Perigeaux’s full selection. Please review Perigeaux’s shipping, returns and cancelation policies before placing an order on our website. If you have any questions about shipping our wine, don’t hesitate to call – 410-586-2710.